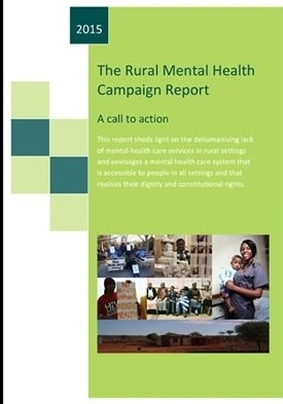 ​​To access a copy of the Rural Mental Health Factsheet go to http://www.rhap.org.za/rural-mental-health-factsheet/. The Rural Mental Health Campaign was launched at the Rural Conference 2014, Worcester, when a group of stakeholders gathered to discuss what could be done to improve the lives of people with mental health problems and decrease the burden of disease for South Africa. The campaign is a joint project of RuReSA, RuDASA, RHAP, PACASA, and SAFMH. The first year of the campaign focused on establishing the role the campaign could play and the stories of mental health service users. The completed report, released publicly on World Mental Health day the 10 October 2015, highlights the challenges that exist in rural mental health care through the testimonies of mental health care users in the Eastern Cape, KwaZulu-Natal, Limpopo and the North West. Rural mental health care services are still largely inadequate due to the lack of service availability and accessibility, budgetary constraints, drugs shortages, insufficient human resource capacity, a lack of integrated care, as well as stigma and discrimination. This was followed by support from the South African Journal of Psychiatry, an interview with SABC radio, an article was published in the Daily Maverick and a press release Mental Health Care is Inadequate during World Mental Health Month 2015 - follow on #DignityInMind and #WMHD2015. The campaign continues to research into the perceptions of mental health service users, to find out more about the campaign contact us!